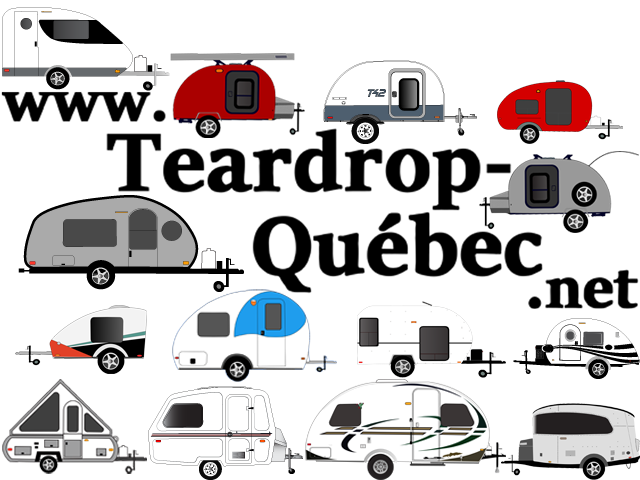 The teardrop trailer has been a staple of the camping world since the 1940s, prized thanks to its affordability and practicality. And while many campers and vans just keep getting bigger and more luxurious, a new class of outdoor companies are looking to reinvent the classic teardrop shape with more modern amenities. Love campers and trailers? Come join our new community group. 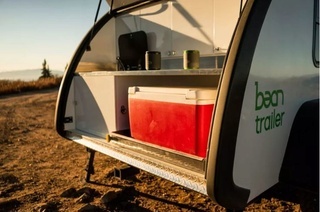 The latest camper to hit the trail is the brand new Utah-based Bean Trailer. 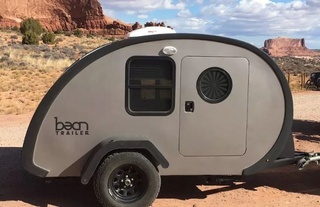 Founded by Mark Harling, an avid outdoorsman, the Bean hopes to deliver the luxury of RVs without the hassle of towing a large vehicle. The compact design stays true to the teardrop shape, with sleeping quarters for two and a galley kitchen accessed from the outside. But Harling and his team use real wood veneer cabinets and amenities like accent lighting, Bluetooth speakers, and custom Maharam upholstery. The Bean also features a queen size mattress, not the smaller full mattress that comes in some teardrops. 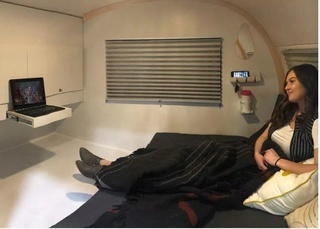 At 14-feet long, the trailer can be used with the mattress down for sleeping or pushed up to make a sofa-like lounging area. 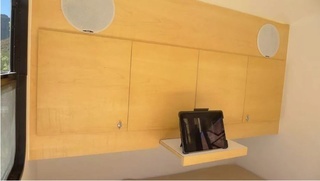 The interior boasts integrated floor storage, cabinets, adjustable shelves and even cup holders to keep things clean. Outside, the standard galley kitchen includes cabinetry, a small dome light, laminate countertop, and 12V and AC outlets. 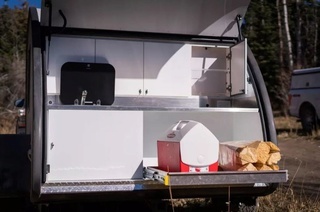 More options are available as upgrades, including a sink, a helpful cooler tray that slides out to make access easier, and a propane stove. A pass-through window lets chefs working in the kitchen hand food to their friends inside. 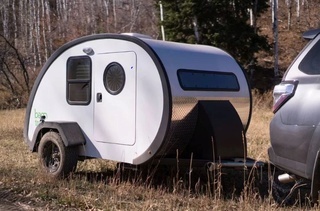 Although the trailer stays true to the classic teardrop shape, it also uses better materials than many of the vintage trailers; a powder-coated tubular steel frame and fiberglass teardrop shell mean that the Bean should hold up well over time. The base level Bean package starts at $18,995, weighs 1,500 pounds, and buyers can add on a plethora of options—think more lights, fans, roof rails, etc.—that will add to the cost. The more expensive premium version ($19,995) gets you dual entry doors, a front window, and maple wood cabinets instead of white laminate. 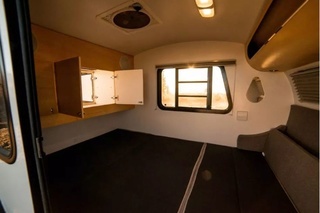 And while the Bean by itself can’t compare to the accommodations of larger travel trailers like Taxa Outdoor’s the Mantis, you can add a hardshell roof-top tent to sleep another two people. The trailer just debuted at the Utah RV show. Head over here for more.